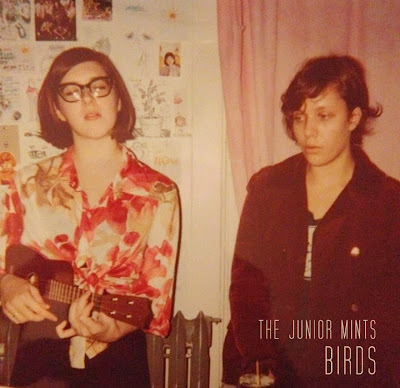 The Junior Mints' beautiful album Birds is the best kept secret on the Internet. The Junior Mints are kind of a hidden secret on the Internet. College friends Lily and Alison started making music together when they attended art school in upstate New York and released an album titled Birds on Purevolume in 2011. They've been on a hiatus of sorts since then, assumedly due to graduating and moving separate cities (which is something that is all too real as I'm moving out of my college house this week). For unspecified reasons the duo decided to re-post an alternative version of Birds in late July and this time on Bandcamp instead of Purevolume. I first heard the music of college friends Lily and Alison a few weeks ago and I gradually fell in love with the delicate beauty that runs through all of Birds. Regardless of why The Junior Mints have decided to reignite their web presence, I'm glad they did because I probably wouldn't have come upon their music if they hadn't. The music of Alison and Lily didn't lose any of its magic while it was floating around in digital space. Their songs are simple and quiet but each hold a specific warmness and familiarity in them. Alison and Lily use small techniques like adding the sound of bird chirping in the original version of "You are a Bird" and short, intimate breaths on "Overcast Afternoon" to add complex layers to their songs that usually keep instruments to a minimum. On their Bandcamp, they note that they only used a Casiotone keyboard, a ukelele, and a toy xylophone amongst "any daily objects they could use for miscellaneous instruments". This may not seem like a lot, but they manage to make the most of what they have and strive at creating songs that burrow their way into your heart. The subject matter of songs "Metamorphosis" and "There" bring to mind past relationships and crushes and even (mostly) instrumental songs such as "The October Song" and "Kiss Me" conjure up a bundle of feelings. Birds reminds me of lying in bed on hazy summer afternoons in my bedroom at home and the subtle feelings that come with falling in and out of love. Even if the two friends lived on opposite sides of the world, they should never stop collaborating on music. Listen to Birds and find out more about The Junior Mints here.